A wise PLC programmer once told me that the ﬁrst thing any aspiring programmer should learn about the PLC they intend to program is how the digital memory of that PLC is organized. This is sage advice for any programmer, especially on systems where memory is limited, and/or where I/O has a ﬁxed association with certain locations in the system’s memory. Virtually every microprocessor-based control system comes with a published memory map showing the organization of its limited memory: how much is available for certain functions, which addresses are linked to which I/O points, how diﬀerent locations in memory are to be referenced by the programmer. Discrete input and output channels on a PLC correspond to individual bits in the PLC’s memory array. Similarly, analog input and output channels on a PLC correspond to multi-bit words (contiguous blocks of bits) in the PLC’s memory. The association between I/O points and memory locations is by no means standardized between diﬀerent PLC manufacturers, or even between diﬀerent PLC models designed by the same manufacturer. This makes it diﬃcult to write a general tutorial on PLC addressing, and so my ultimate advice is to consult the engineering references for the PLC system you intend to program. The most common brand of PLC in use is Allen-Bradley (Rockwell), which happens to use a unique form of I/O addressing (Note 1), students tend to ﬁnd confusing. For these two reasons (popularity and confusion), I will focus on Allen-Bradley addressing conventions for the bulk of this section. Note 1 : The most modern Allen-Bradley PLCs have all but done away with ﬁxed-location I/O addressing, opting instead for tag name based I/O addressing. However, enough legacy Allen-Bradley PLC systems still exist in industry to warrant coverage of these addressing conventions. Memory Map also called the data table, this map shows the addressing of memory areas reserved for programs entered by the user. 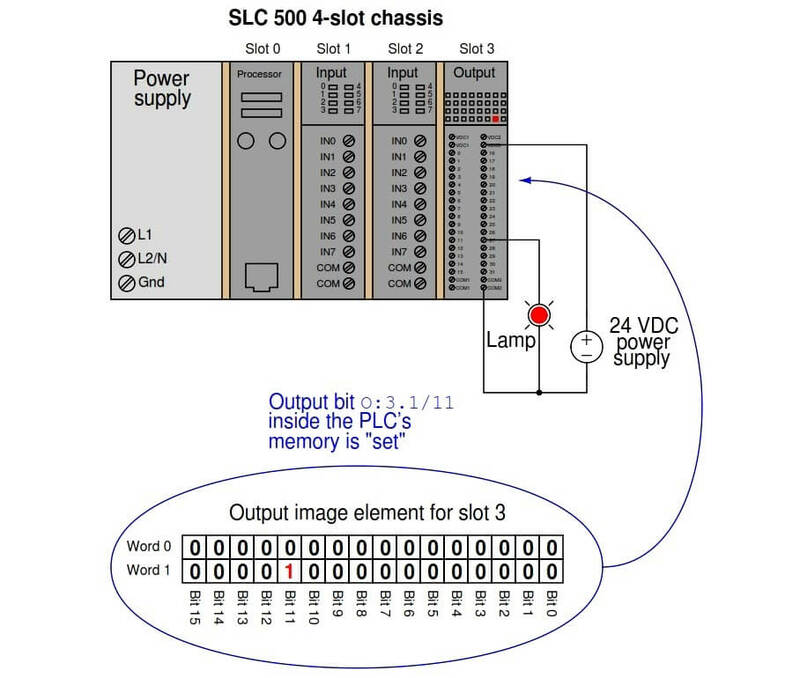 Other areas of memory exist within the SLC 500 processor, but these other areas are inaccessible to the technician writing PLC programs. Note that Allen-Bradley’s use of the word “ﬁle” diﬀers from personal computer parlance. In the SLC 500 controller, a “ﬁle” is a block of random-access memory used to store a particular type of data. By contrast, a “ﬁle” in a personal computer is a contiguous collection of data bits with collective meaning (e.g. a word processing ﬁle or a spreadsheet ﬁle), usually stored on the computer’s hard disk drive. Within each of the Allen-Bradley PLC’s “ﬁles” are multiple “elements,” each element consisting of a set of bits (8, 16, 24, or 32) representing data. Elements are addressed by number following the colon after the ﬁle designator, and individual bits within each element addressed by a number following a slash mark. For example, the ﬁrst bit (bit 0) of the second element in ﬁle 3 (Binary) would be addressed as B3:2/0. 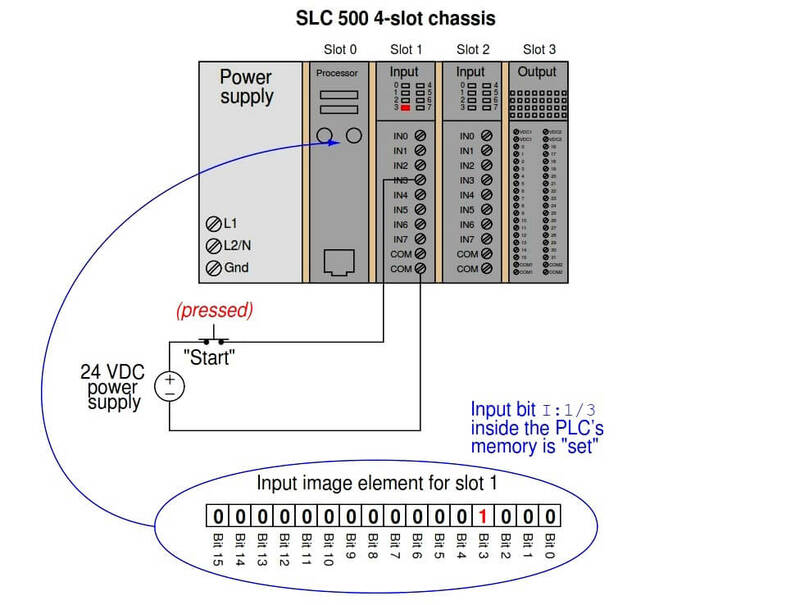 In Allen-Bradley PLCs such as the SLC 500 and PLC-5 models, ﬁles 0, 1, and 2 are exclusively reserved for discrete outputs, discrete inputs, and status bits, respectively. Thus, the letter designators O, I, and S (ﬁle types) are redundant to the numbers 0, 1, and 2 (ﬁle numbers). 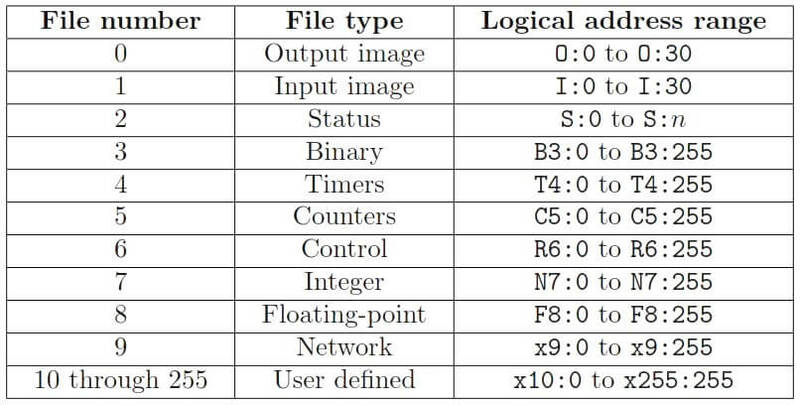 Other ﬁle types such as B (binary), T (timers), C (counters), and others have their own default ﬁle numbers (3, 4, and 5, respectively), but may also be used in some of the user-deﬁned ﬁle numbers (10 and above). For example, ﬁle 7 in an Allen-Bradley controller is reserved for data of the “integer” type (N), but integer data may also be stored in any ﬁle numbered 10 or greater at the user’s discretion. Thus, ﬁle numbers and ﬁle type letters for data types other than output (O), input (I), and status (S) always appear together. You would not typically see an integer word addressed as N:30 (integer word 30 in the PLC’s memory) for example, but rather as N7:30 (integer word 30 in ﬁle 7 of the PLC’s memory) to distinguish it from other integer word 30’s that may exist in other ﬁles of the PLC’s memory. This ﬁle-based addressing notation bears further explanation. When an address appears in a PLC program, special characters are used to separate (or “delimit”) diﬀerent ﬁelds from each other. Not all ﬁle types need to distinguish individual words and bits. Integer ﬁles (N), for example, consist of one 16-bit word for each element. For instance, N7:5 would be the 16-bit integer word number ﬁve held in ﬁle seven. A discrete input ﬁle type (I), though, needs to be addressed as individual bits because each separate I/O point refers to a single bit. Thus, I:3/7 would be bit number seven residing in input element three. The “slash” symbol is necessary when addressing discrete I/O bits because we do not wish to refer to all sixteen bits in a word when we just mean a single input or output point on the PLC. Integer numbers, by contrast, are collections of 16 bits each in the SLC 500 memory map, and so are usually addressed as entire words rather than bit-by-bit . Certain ﬁle types such as timers are more complex. Each timer “element ” consists of two diﬀerent 16-bit words (one for the timer’s accumulated value, the other for the timer’s target value) in addition to no less than three bits declaring the status of the timer (an “Enabled” bit, a “Timing” bit, and a “Done” bit). Thus, we must make use of both the decimal-point and slash separator symbols when referring to data within a timer. Suppose we declared a timer in our PLC program with the address T4:2, which would be timer number two contained in timer ﬁle four. A hallmark of the SLC 500’s addressing scheme common to many legacy PLC systems is that the address labels for input and output bits explicitly reference the physical locations of the I/O channels. For instance, if an 8-channel discrete input card were plugged into slot 4 of an Allen Bradley SLC 500 PLC, and you wished to specify the second bit (bit 1 out of a 0 to 7 range), you would address it with the following label: I:4/1. Addressing the seventh bit (bit number 6) on a discrete output card plugged into slot 3 would require the label O:3/6. In either case, the numerical structure of that label tells you exactly where the real-world input signal connects to the PLC. 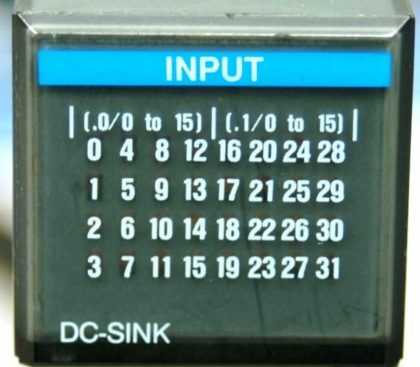 If an input or output card possesses more than 16 bits – as in the case of the 32-bit discrete output card shown in slot 3 of the example SLC 500 rack – the addressing scheme further subdivides each element into words and bits (each “word” being 16 bits in length). The ﬁrst sixteen input points on this card (the left-hand LED group numbered 0 through 15) are addressed I:X.0/0 through I:X.0/15, with “X” referring to the slot number the card is plugged into. The next sixteen input points (the right-hand LED group numbered 16 through 31) are addressed I:X.1/0 through I:X.1/15. Legacy PLC systems typically reference each one of the I/O channels by labels such as “I:1/3” (or equivalent ) indicating the actual location of the input channel terminal on the PLC unit. The IEC 61131-3 programming standard refers to this channel-based addressing of I/O data points as direct addressing. A synonym for direct addressing is absolute addressing. Addressing I/O bits directly by their card, slot, and/or terminal labels may seem simple and elegant, but it becomes very cumbersome for large PLC systems and complex programs. Every time a technician or programmer views the program, they must “translate” each of these I/O labels to some real-world device (e.g. “Input I:1/3 is actually the Start push-button for the middle tank mixer motor”) in order to understand the function of that bit. A later eﬀort to enhance the clarity of PLC programming was the concept of addressing variables in a PLC’s memory by arbitrary names rather than ﬁxed codes. The IEC 61131-3 programming standard refers to this as symbolic addressing in contrast to “direct” (channel-based) addressing, allowing programmers arbitrarily name I/O channels in ways that are meaningful to the system as a whole. To use our simple motor “Start” switch example, it is now possible for the programmer to designate input I:1/3 (an example of a direct address) as “Motor start switch” (an example of a symbolic address) within the program, thus greatly enhancing the readability of the PLC program. Initial implementations of this concept maintained direct addresses for I/O data points, with symbolic names appearing as supplements to the absolute addresses. The modern trend in PLC addressing is to avoid the use of direct addresses such as I:1/3 altogether, so they do not appear anywhere in the programming code. The Allen-Bradley “Logix” series of programmable logic controllers is the most prominent example of this new convention at the time of this writing. Each I/O point, regardless of type or physical location, is assigned a tag name which is meaningful in a real-world sense, and these tag names (or symbols as they are alternatively called) are referenced to absolute I/O channel locations by a database ﬁle. An important requirement of tag names is that they contain no space characters between words (e.g. instead of “Motor start switch”, a tag name should use hyphens or underscore marks as spacing characters: “Motor start switch”), since spaces are generally assumed by computer programming languages to be delimiters (separators between diﬀerent variables). Having introduced Allen-Bradley’s addressing notation for SLC 500 model PLCs, I will now abandon it in favor of the modern convention of symbolic addressing throughout the rest of the articles, so as to avoid making the programming examples brand- or model-speciﬁc. Each data point within my PLC programs will bear its own tag name rather than a direct (channel-based) address label.